Nursing Research and Statistics is precisely written as per the Indian Nursing Council syllabus for the B.Sc. Nursing students. It may also serve as an introductory text for the postgraduate students and can also be helpful for GNM students and other healthcare professionals. The book is an excellent attempt towards introducing the students to the various research methodologies adopted in the field of nursing. 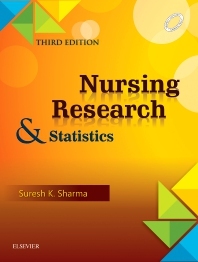 Nursing Research: Expansion in existing content with more relevant practical examples from Indian scenario and inclusion of new topics such as Revised ICMR, National Ethical Guidelines for Biomedical and Health Research involving Human Participants-2017, Institute Ethical Committee, New classification of variables, New classification of assumptions, Annotated bibliography, Process of theory development, Updated classification of quantitative research designs, Newer methods of randomization, Clinical trials, Ecological research, Mixed method research designs, Types of risk bias in research, Voluntary sampling technique, Sampling in qualitative studies, Procedure of data collection, Guidelines for writing effective discussion, List of computer software used for qualitative data analysis, Reporting guidelines for various types of research studies, Reference management software, and Intramural & extramural research funding. Statistics: The existing content of statistics was supplemented with new more relevant examples and some of new topics were added such as Risk indexes (Relative Risk and Odd Ratio), Statistics of diagnostic test evaluation, Simple linear, Multiple linear and Logistic regression, and SPSS widow for statistical analysis. Multiple Choice Questions: Approximately 100 more multiple choice questions have been included, placed at the end of each chapter. These MCQs will be useful for the readers to prepare for qualifying entrance examinations, especially MScN and PhD nursing courses. Chapter Summary: Every chapter has been provided with a chapter summary at the end of each chapter to facilitate for quick review of content.